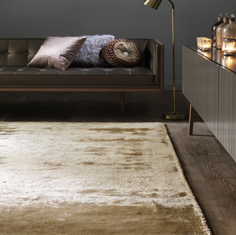 Ultra chic and alluring our Dolce rug collection is full of glamour and panache. A mixture of shiny viscose and cotton which is hand washed for radiance and a soft organic feel, ultra sophisticated and full of metallic shimmer. Dolce rugs are hand-woven in India by expert weavers, the plain pile changes colour with variations in light and viewing angle, plain but interesting! Available in 8 popular colours and 3 stock sizes, bespoke sizes are available to order.